The peerless Virat Kohli on Tuesday became the first cricketer to make a clean-sweep of the ICC's annual individual awards and was also named captain of the world body's Test and ODI teams of the year, line-ups which were dominated by Indian players. 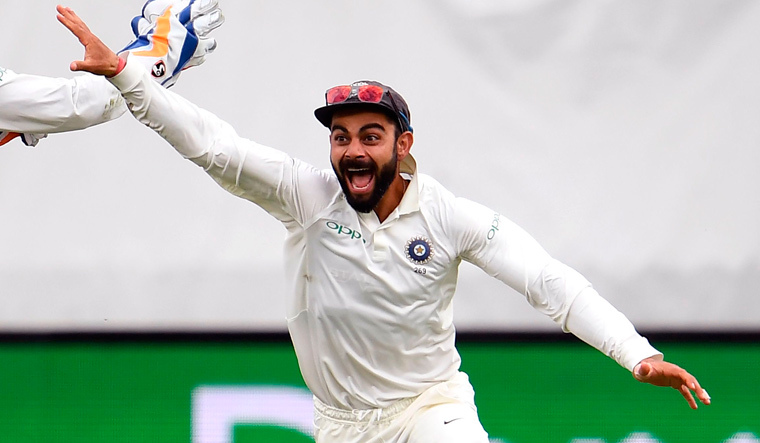 Kohli became the first player in history to win the Sir Garfield Sobers Trophy for ICC Cricketer of the Year, his second consecutive, the ICC Test and the ODI Player of the Year awards following an extraordinary 2018. Besides, the rapidly-rising wicket-keeper Rishabh Pant claimed the ICC's Emerging Cricketer of the Year award. “Not only is Kohli the first player to win these three major ICC awards together, but he has also been named the captain of the ICC Test and ODI teams of the year for a fabulous run in international cricket,” the ICC said in a statement. Kohli scored 1,322 runs at an average of 55.08 in 13 Tests with five hundreds during the calendar year while in 14 ODIs he amassed 1,202 runs at an astonishing average of 133.55 with six centuries. He also scored 211 runs in 10 T20Is. Cricket rules: ICC to replace coin toss with Twitter poll, allow double-wicket play? “It's a reward for all the hard work that you do throughout the calendar year. Having recognition at the global level from the ICC is something you feel proud of as a cricketer because you understand that there are many players playing the game,” Kohli was quoted as saying by the world body in a release. “... obviously a very proud moment for me and something that gives you more motivation to keep repeating the same things because you have to keep the standard of cricket up and keep bringing in consistent performances,” he added. Three players each from India and New Zealand featured in the ICC's Test team of the year, while four each from India and England are part of the ODI side of the year 2018. Kohli, who first came into limelight when he led India to victory at the ICC Under-19 World Cup in Malaysia in 2008, finished the year as the top-ranked batsman in Tests and ODIs. The highest scorer in both forms of the game in 2018, he was one of only two batsmen to score more than 1,000 runs in Tests and only among three to do so in ODI cricket. Kohli was the unanimous choice of the voting academy for the Sir Garfield Sobers Trophy with South Africa fast bowler Kagiso Rabada coming in second to him for both this award and the Test Player of the Year honour. “This is well-deserved recognition for an extraordinary talent. His regard for the game and particularly for Test cricket is also recognized and appreciated,” ICC Chief Executive David Richardson said. “He is passionate in his support of the longest form of the game and its continued importance...Virat has become a great ambassador for our sport,” he added. Afghanistan leg-spinner Rashid Khan was runner up to Kohli for the ICC ODI Player of the Year award. This was also Kohli's second successive ODI Player of the Year award. In other awards, the Indian under-19 team' World Cup triumph in New Zealand was declared the Fans Moment of the Year with 48 per cent of votes. Sri Lanka's Kumar Dharmasena was voted Umpire of the Year by international captains and the ICC match referees, winning the David Shepherd Trophy for a second time. The ICC Spirit of Cricket Award went to New Zealand captain Kane Williamson for “continuing to be a shining role model of how our game should be played, his behaviour setting an outstanding example on and off the field”.